At Accorde Orthodontics, we believe everyone deserves a healthy, beautiful smile they can be proud of in any situation. We provide high-quality, convenient orthodontic treatment for a variety of orthodontic treatments and malocclusions, and our doctors and team of orthodontic specialists work hard to make every visit to our office a pleasant experience. We know you'll be excited when you get your braces off, but you're not quite out of the woods yet – now comes the retention phase of treatment. nd exciting milestone, it's far from the end of your treatment. After we take your braces off, you'll enter the retention phase of treatment. This phase is critical to ensuring the health and longevity of your smile. While your teeth are in new positions after your treatment with braces, the underlying bones, tendons, and tissues that support them have yet to adapt to those new positions – and that means that without a retainer, your teeth will just move back to their old positions! To prevent this, we'll fit you with a set of custom retainers you'll wear to keep your teeth in position until the rest of your mouth adapts. We'll fit you for your retainers the day we take your braces off, and we'll give you detailed instructions for wearing and caring for your retainers. 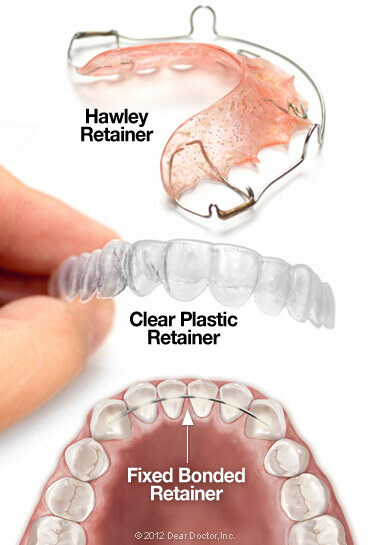 Hawley: The Hawley retainer is the most common, and it's composed of a metal wire running around the teeth and a thin piece of acrylic that's molded to fit the roof of your mouth. It's simple, durable, and easy to take in and out and keep clean, making it a favorite for most patients. Clear Aligner: Clear aligner-type retainers are similar to Invisalign aligners, and they're made from a clear plastic material and made to fit directly onto the dental arch. Clear aligner-type retainers are virtually invisible when worn and easy to take in and out, but they're a little less durable than Hawleys. Fixed: Fixed retainers use a thin metal wire that's bonded to the inside (tongue-side) of the teeth with special dental cement. This means fixed retainers aren't removable, as they're fixed in the mouth – but they're also invisible, because they're on the inside of the teeth. Fixed retainers are ideal for patients with a high risk of having their teeth migrate back to their old positions. Most people have no problem adjusting to their retainer, and many find it easier than getting used to braces. You may find that you produce more saliva than usual when you first start wearing your retainer, or that it's difficult to speak normally. Both of these problems are common and should fade within a day or two. While you'll need to wear your retainer 24/7 at first – removing it only to brush and floss – after some time, you'll only wear it at night, and eventually only a few nights a week. an to keep it safe from germs and bacteria. For Hawley retainers, all you need to do is brush it with toothpaste, just like you would your teeth. A brush may scratch clear aligner retainers, so if you're using one of those, just soak it in a cup with a denture cleaning tablet. You can brush and floss a fixed retainer just like you do your teeth, although you'll likely need to use a floss threader to get underneath the wire. With care and diligent use, your retainer will help to protect your new smile, ensuring you enjoy it for years to come. If you have any questions on retention, orthodontic care, or your orthodontic health in general, feel free to call us at 763-425-9888 or reach out to us at our contact page. Or, if you'd like to come in for an appointment, just request one online at our Maple Grove, Rogers, or Champlin, MN office. We can't wait to hear from you!